The only book of Wilder’s “Little House” series not to feature the author’s family, this book instead recounts the boyhood of her husband Almanzo Wilder on his father’s farm in northern New York state. Almanzo is the youngest of four, and at nine years of age he is desperate to be given more responsibility on the farm. He especially wants to work with the horses, but his father won’t let him handle or even touch the colts, not yet. Almanzo works extra hard at every other job he is given to prove his worth. He breaks two young calves, teaching them how to move as a team in a yoke. He helps haul ice from the pond to the ice house. He harrows and plants potatoes. He helps with the sheep shearing, grows a prize-winning pumpkin, churns butter, picks berries, helps with the harvest, and makes candles. His father runs a pretty tight ship, there’s not a lot of time for play, although they do enjoy the county fair, and the children are left on their own for a whole blissful week of doing as they please when their parents go to visit relatives. Mealtimes are recounted in great detail, as Almanzo loves his food almost as much as he loves horses, and has an immense appetite. The Wilder farm is a large and prosperous operation for the time, and Almanzo’s father keeps his children working very hard all through the year. Almanzo lives in fear of getting a whipping from his father, but manages to steer clear of such punishment. And amid all the hard work there are also moments of great humour, as Almanzo finds an opportunity or two to cut loose. By the end of the book Almanzo has displayed great determination and self-discipline. Even at his young age there is talk about his future, and he is certain that he wants to remain on the farm (rather than learning a trade in town), if only to stay near his beloved horses. And right at the end of the book his father finally agrees to allow him to raise and break one of the colts – surely the greatest moment of his young life. Even though she is recounting the life of her husband, Wilder does so with the same detail and warmth that she shows in her autobiographical works. She does a terrific job of portraying the young boy’s point of view – his aspirations, opinions and passions. And his yearning for suppertime. 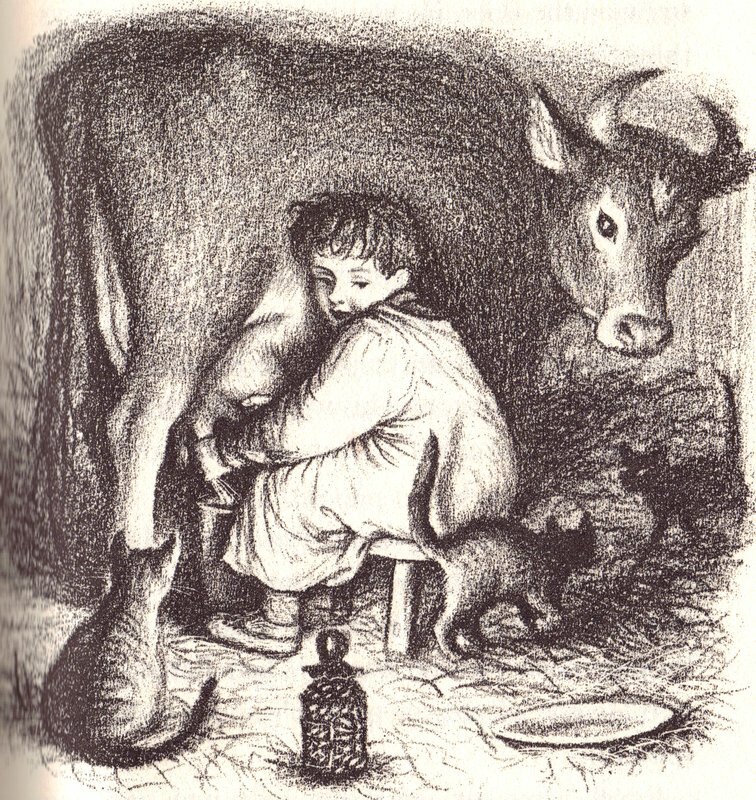 As with the other “Little House” books, the most common editions out now feature the illustrations of Garth Williams, which are sweet and appealing, and can fill in some of the gaps if you’re not quite following the description of what they are doing. A book about proving your worth and earning trust – about responsibility and hard work. It’s a convincing portrait of a boy navigating the waters between childhood and adulthood. The book “Farmer Boy” sounds a lot like one my brothers who still loves farming. Thanks for the review.